Today was huge. Definitely our biggest on trail so far. 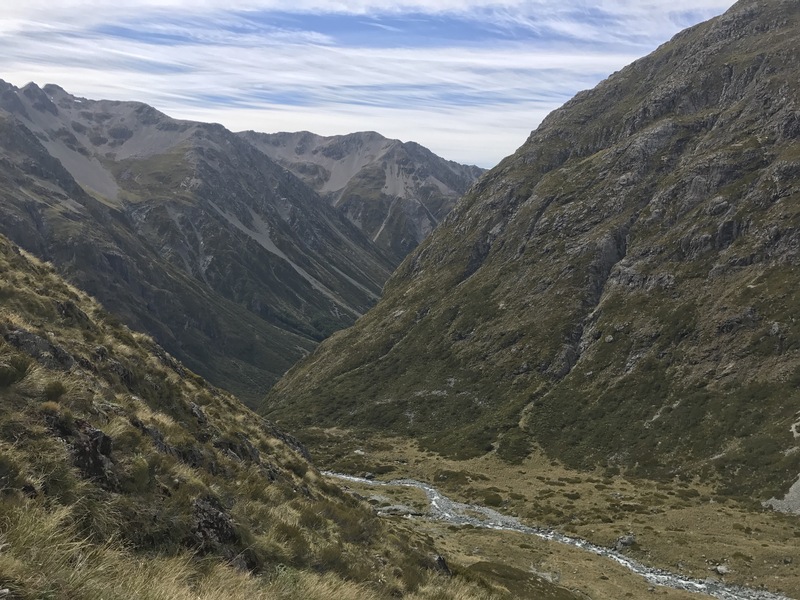 We walked 44 km back on day 44, but this one takes the cake as it included Waiau pass, a challenging alpine saddle with some of the most rewarding views of the trail. 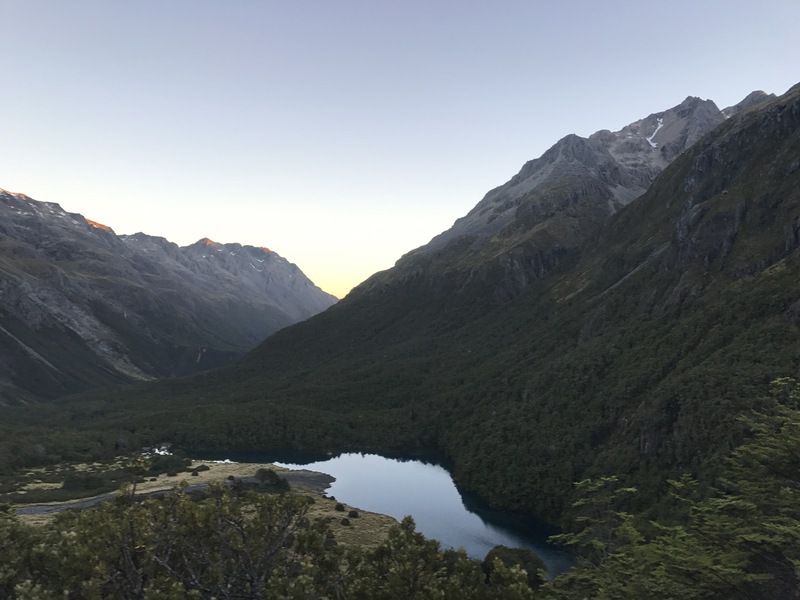 After two days confined to Blue Lake Hut due to gnarly weather, we were ready to get up early to get going on what we figured would end up being a super heavy day to Anne Hut. 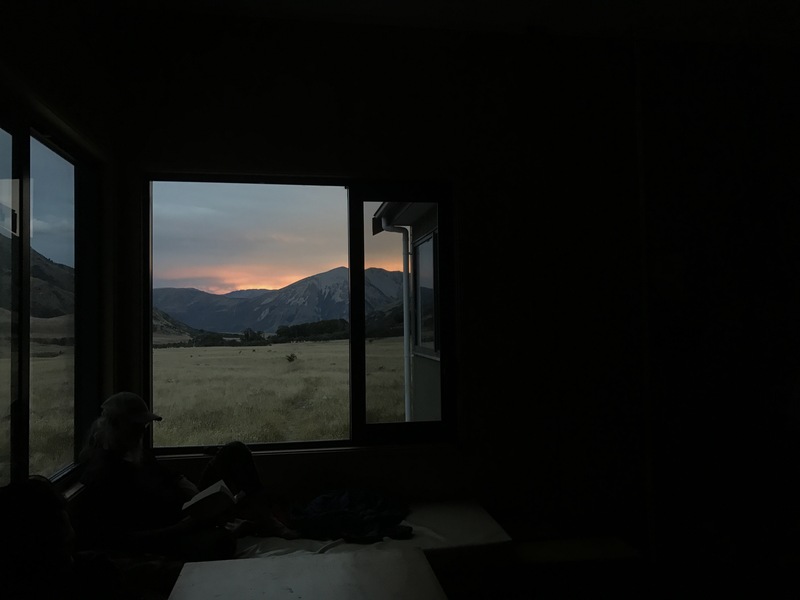 We woke up at 5:30 AM, just before the light started to shine over the surrounding mountains. We ate breakfast in our sleeping bags as the clear night made for an absolutely freezing morning. We were excited to get rolling, to climb to warm up. 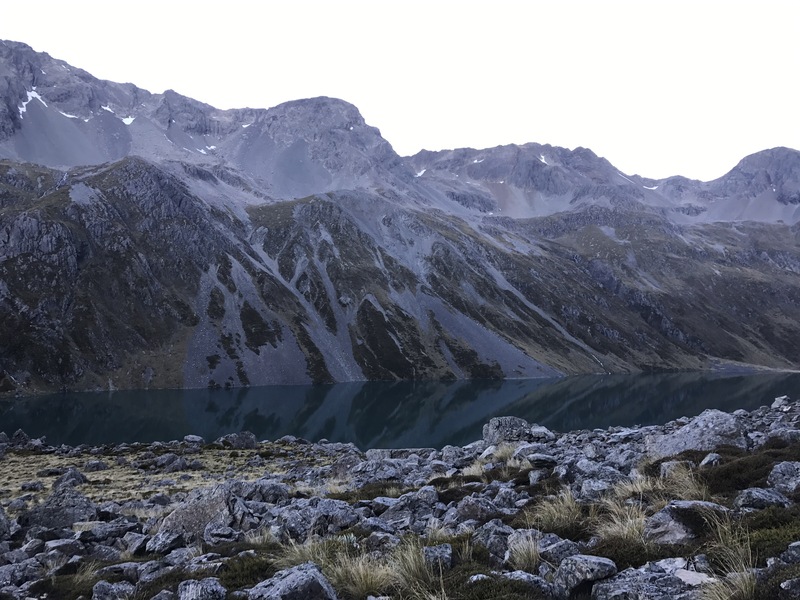 The sun hadn’t yet broken above the mountains, but there was plenty of light to say another hello to Blue Lake, the incredibly clear, spring-fed body of near-pure water for which the hut is named. According to some data collected by scientists in partnership with the DoC, the remote lake consists of some of the world’s clearest water, with horizontal visibility reaching up to 80 meters. 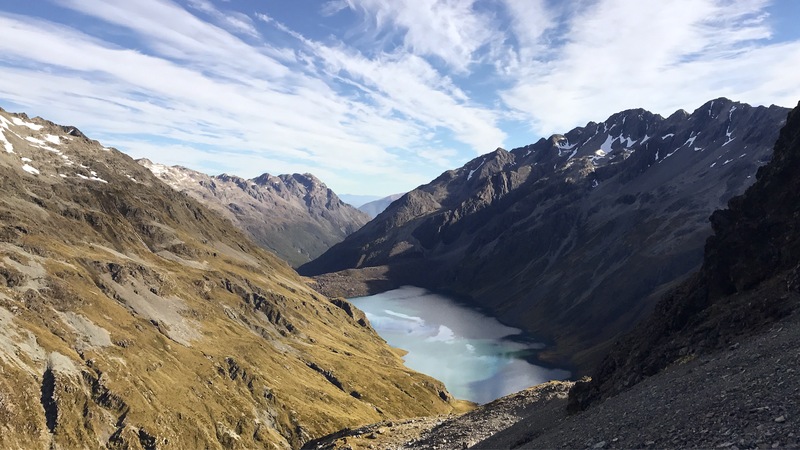 We passed blue lake on our way toward the true Waiau pass track, beginning with the climb up to Lake Constance, a much bigger spring-fed lake that serves as one of Blue Lake’s main sources. Lake constance was beautiful: deep blue water fenced in by monolithic stone peaks. A large ascent up and around some such cliffs brought us to a section of the lake some us decided to wade. It was about waste deep and extremely cold, but provided a nice alternative to scrambling up and down the jagged rocks that line the water. At this point in the day my fingers and toes were feeling absolutely awful. While Shepard was loving the cold, thinking back to winter days of Pond Hockey back home, the rest of us were considering digital amputation. The saving grace, however, was the unparalleled landscape. The valley was gorgeous, the sun slowly creeping down the 2000 meter high peaks. 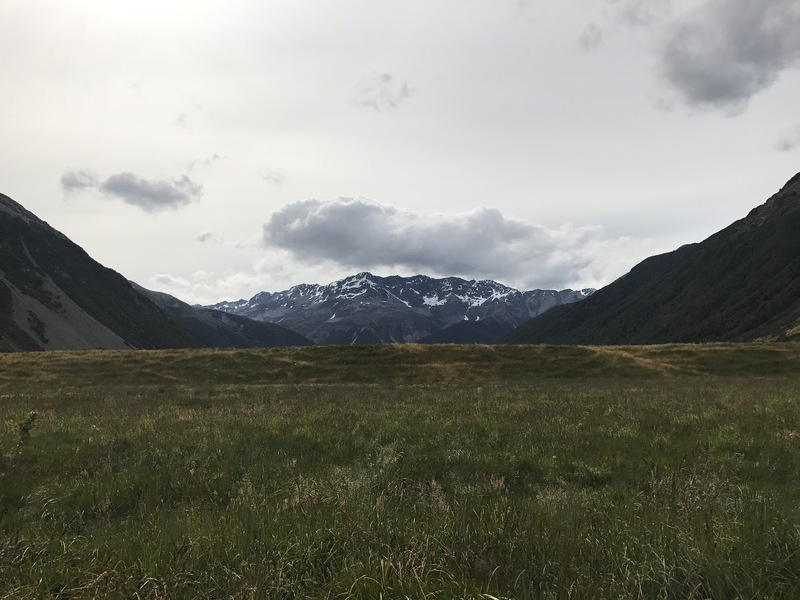 As we crossed flooded streams and froze our feet even further, we fantasized about the moment the sun reaches far enough down into the valley to warm the frosty appendages. 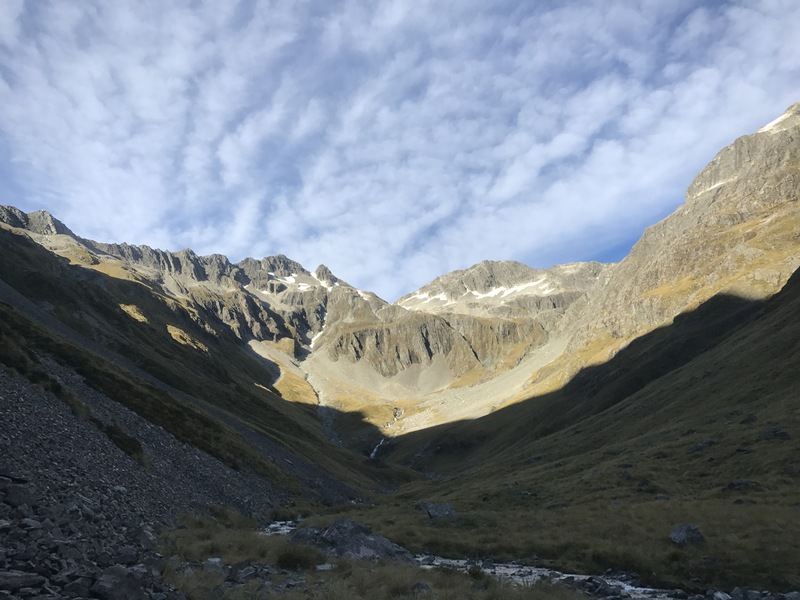 Soon we began the ascent up Waiau pass. 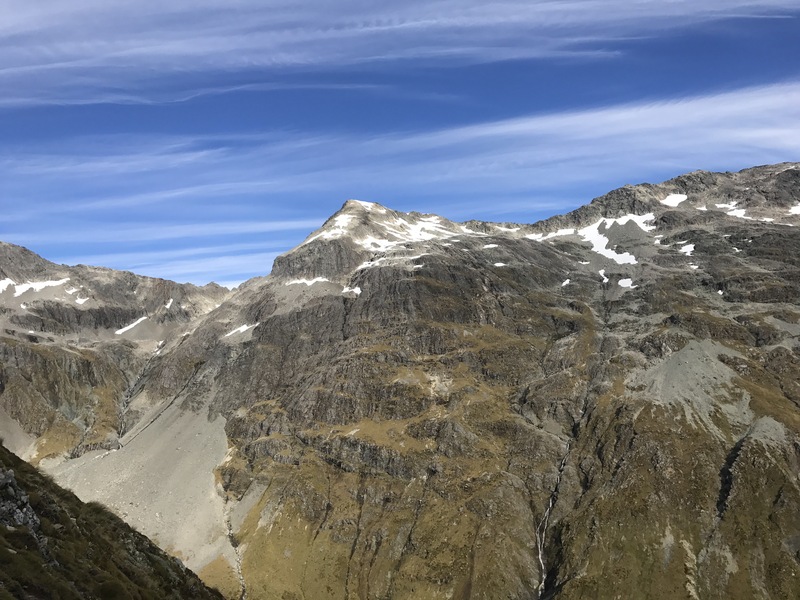 500 meters above the valley floor (1,870 meters), Waiau pass marked the highest point of the journey so far (not including the peaks in Tongariro National Park). The climb straight up the loose rocks was tiring and slightly frustrating. The rocks would loosen with every step, and frozen toes did not help the situation. Regardless, it was impossible not to notice how epic a morning it was turning into. The massive snow-covered peaks around us were now lit up brightly by the sun. When we reached the false summit, the sun reached our faces, too. Lake Constance below was beaming with the reflection of peaks we passed earlier this week. We scrambled up the remaining stretch to the pass, where we stopped to enjoy the remarkable view and soak up the now 9:00 AM sun. At the top we found big mounds of snow and Shepard got to make a couple snowballs after months of waiting for some snowy mountaintops. 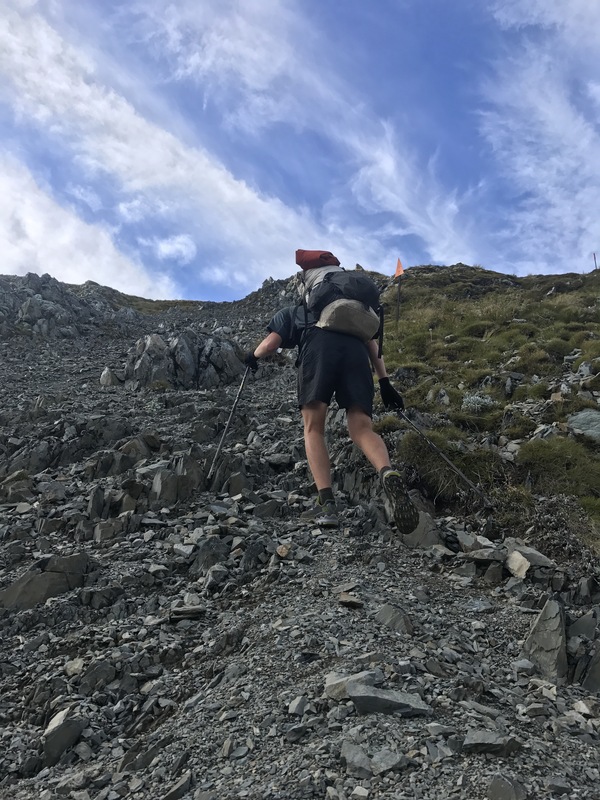 We ate a snack and after a few minutes up top, said goodbye to the lake constance side of the saddle, and started the descent. On the way down we saw a tent pitched on the edge of a rocky flat. It was quite a ways off the trail and looked to be in quite an exposed spot so we decided to make sure whoever was inside was doing alright. The tent turned out to be a sturdy mountaineering Hilleberg, pitched by someone clearly more experienced than us, who was nowhere to be found. They likely were using the tent as a basecamp from which to explore the area rather than post up at a hut like us. 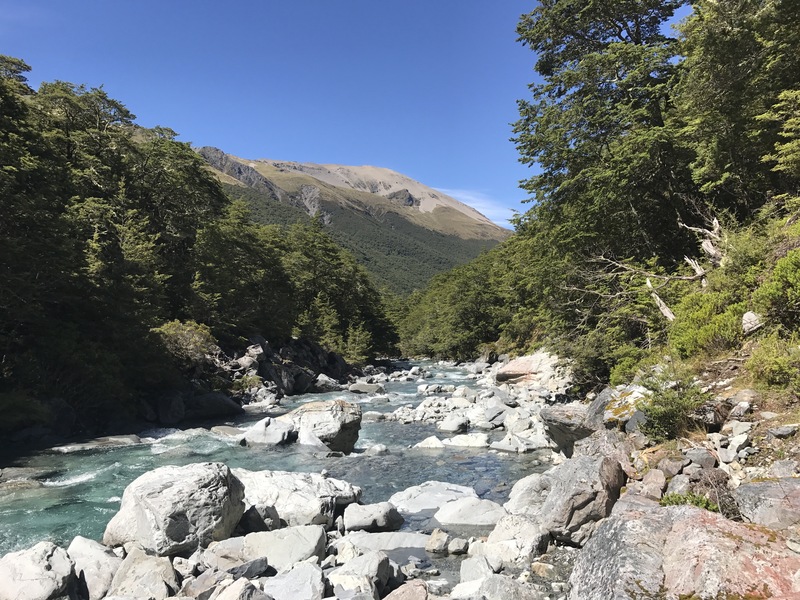 I headed back to the trail and we all got walking again, descending jagged steep rock faces 900 meters to the river valley. The descent took a long time but once we made it down to the river, the track flattened out. With the exception of several large washouts and long stretches of rockhop, the trail remained flat. Soon the trail became increasingly well-traveled, allowing us to make quick work of the remaining 35 kilometers in our day. 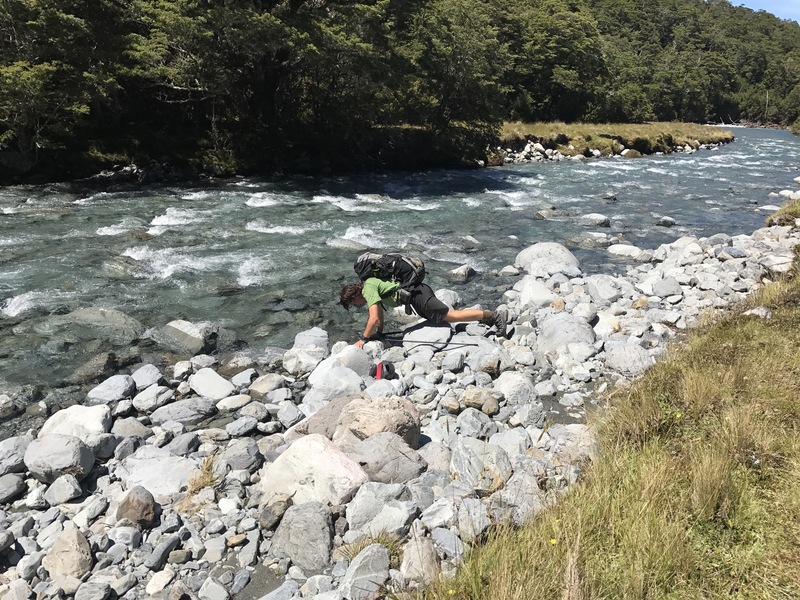 We walked along the gorgeous Waiau River, crossing the main branch and plenty of sidestreams along the way. At midday we had lunch at Caroline Creek Bivvy. 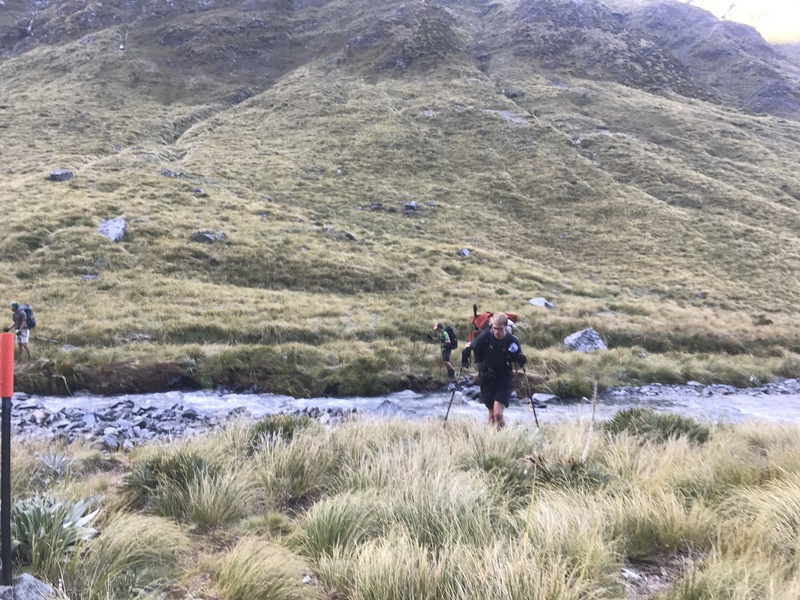 Getting stuck in Blue Lake hut for 3 nights meant that plenty of walkers got backed up behind us. That way we knew that the flat spots near the bivvy would be super full tonight, so we were happy to be heading on for the day. After a quick lunch we got rolling again, with the sun high in the sky and an odd haze rolling in. The afternoon was super long. 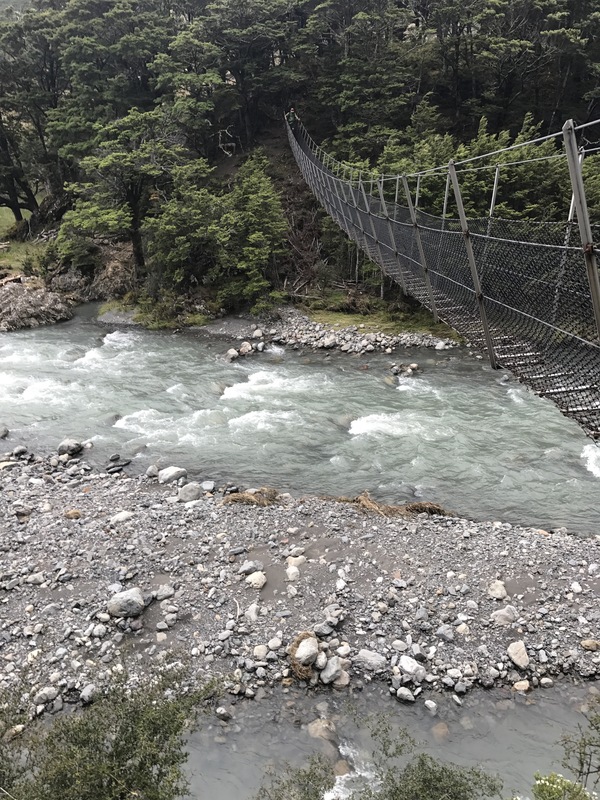 Relatively uneventful with the exception of the occasional stream-crossing made difficult by the previous week’s rain. By 5:00 we were totally beat. 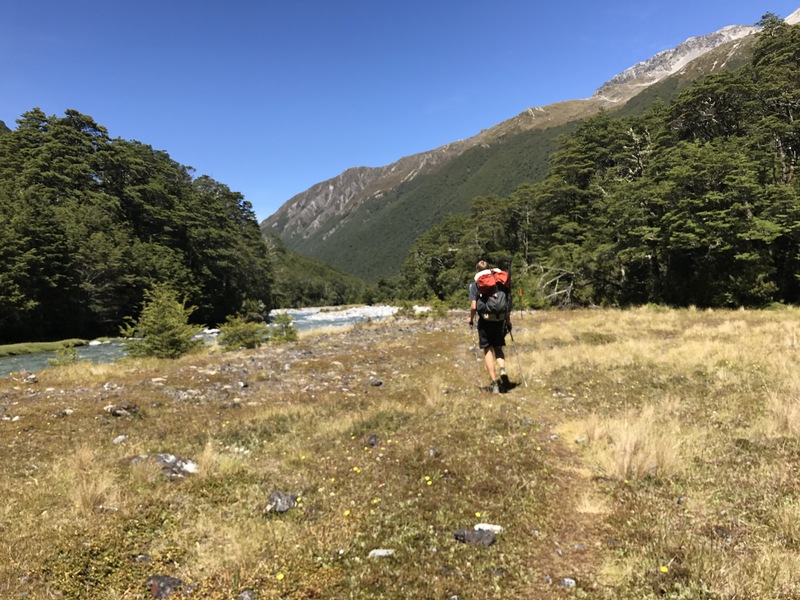 We had made it to the 4WD track that would lead us to St James walkway and Anne Hut, but only after three more hours of walking, and crossing the Ada River. Walking was tedious and mundane for a while, save the epic river-valley surroundings. At a certain point we became too tired and sore to fully appreciate them. We passed Ada Homestead and came upon the Ada river crossing. The current was strong and the main channels quite deep. Jack tried one of the channels and got swept a little too deep but managed to get a foothold on the far shore and got out. The three of us remaining found a better channel to cross and practiced our river crossing technique. We got across easily with a handful of km left in our day. The rest of the day was spent chugging along the flat 4WD track, fantasizing about reaching our day’s lofty goal. When we weren’t sure how to follow the map to the approaching swingbridge, it became extremely clear that we were tired. Glad to not have been in a tricky section of trail that late. After the final swingbridge crossing of the Henry River, it was only 2 km left to go. 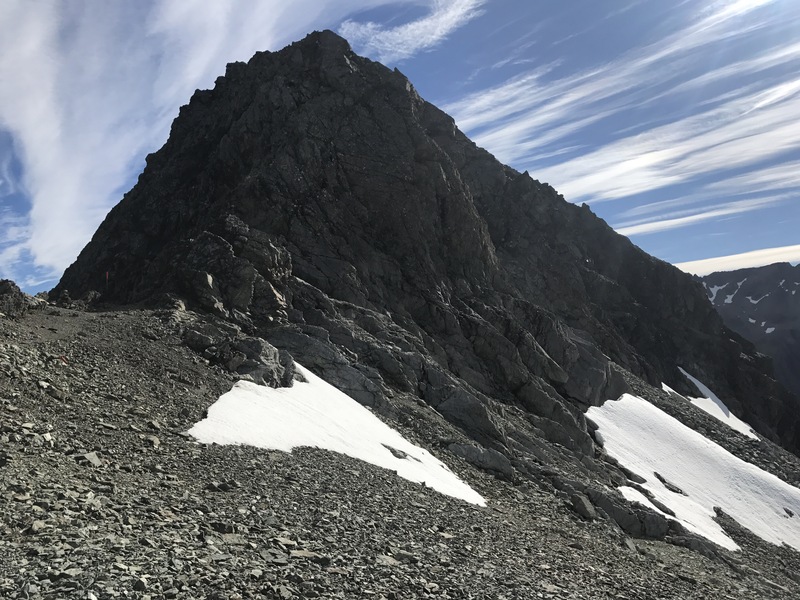 Despite our soreness, we made quick work of the 2 km, and arrived at Anne Hut at around 8:00 PM. We got the water on the burner and had dinner rolling promptly. The new hut was quite large but only one other man was staying in it for the night. He had started a fire in the stove to warm the hut, a welcome surprise as it had started to get quite cold outside. Hopefully tomorrow we can wake up to dry shoes and weather at least slightly better than forecasted. 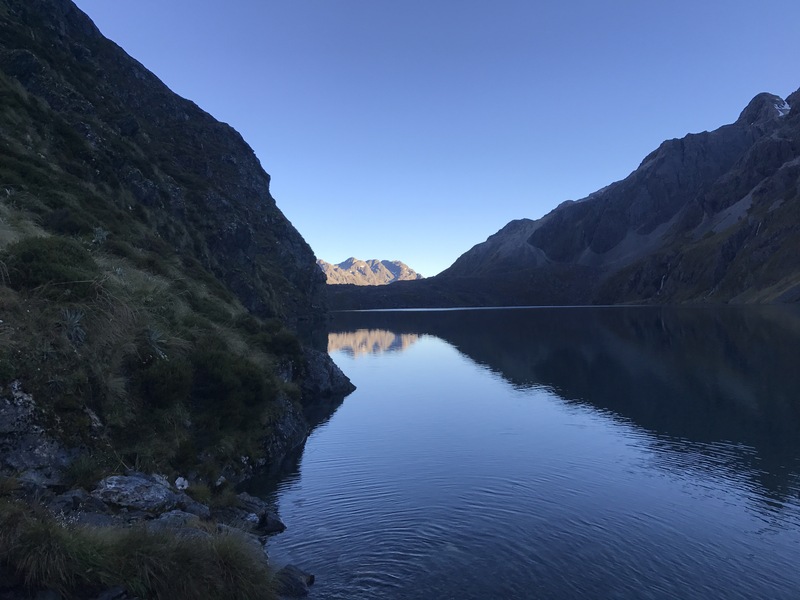 The length of our day makes it easy to forget we started this morning with Lake Constance and the Waiau Pass track. In my opinion it was the most beautiful section so far, not to be minimized by the big afternoon. Glad we could rally to accomplish such a big day to get out of the hairy stuff for tonight/tomorrow’s predicted bad weather. Trully a marathon day Boys. 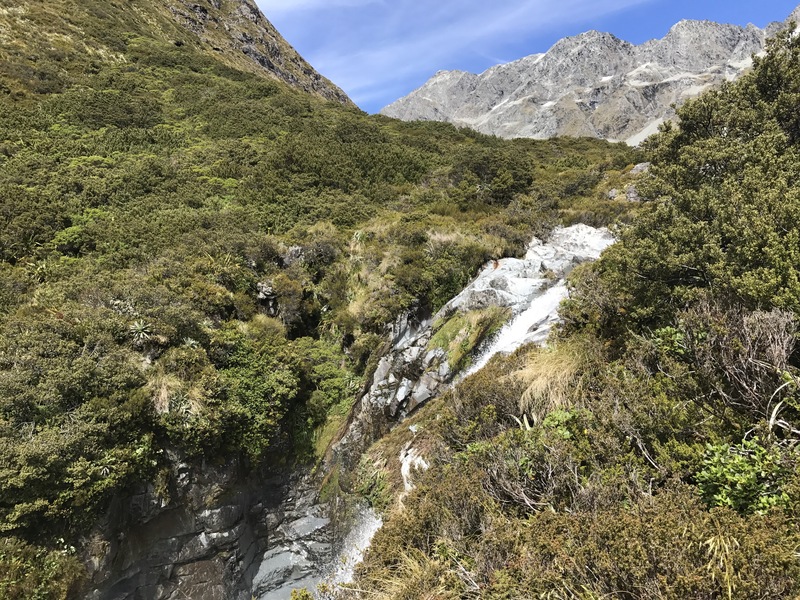 Miles and i walked from West Sabine Hut to Blue Lake in December and we thought that was enough. 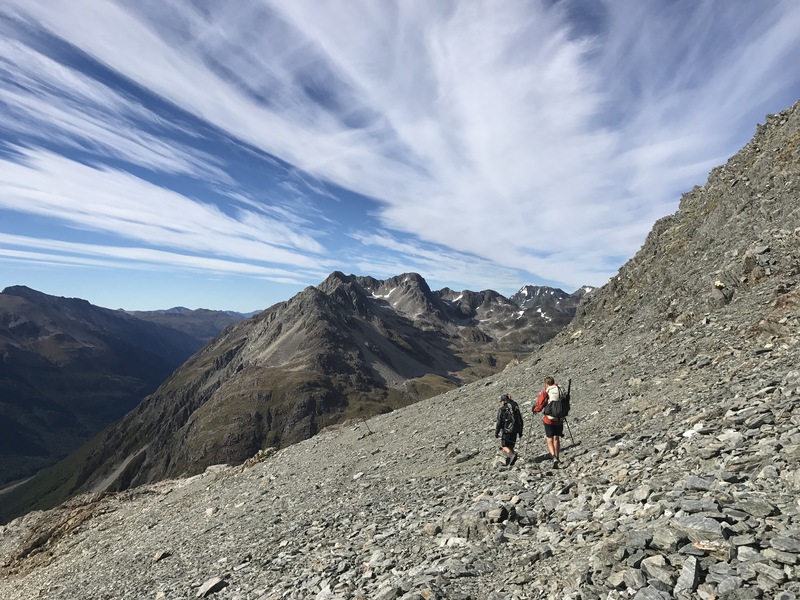 We walked up to lake Constance and back to west sabine Hut the next day. WOW what a massive effort guys and through such beautiful surroundings!